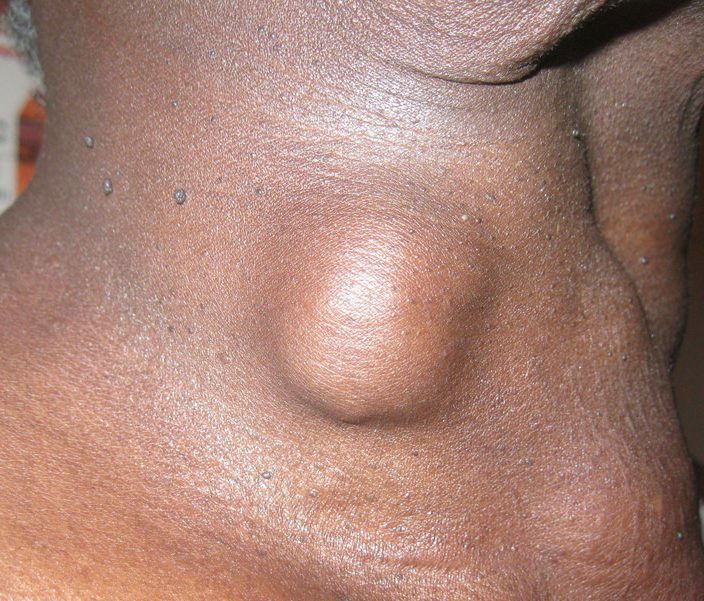 Thyroid lumps are a common presentation, seen in up to 5% of the population, however only a small proportion of them are cancerous. There are different types of cancer that can affect the thyroid gland, all of which can present with different features. The main types of thyroid cancer are papillary, follicular, medullary, anaplastic, and lymphoma. 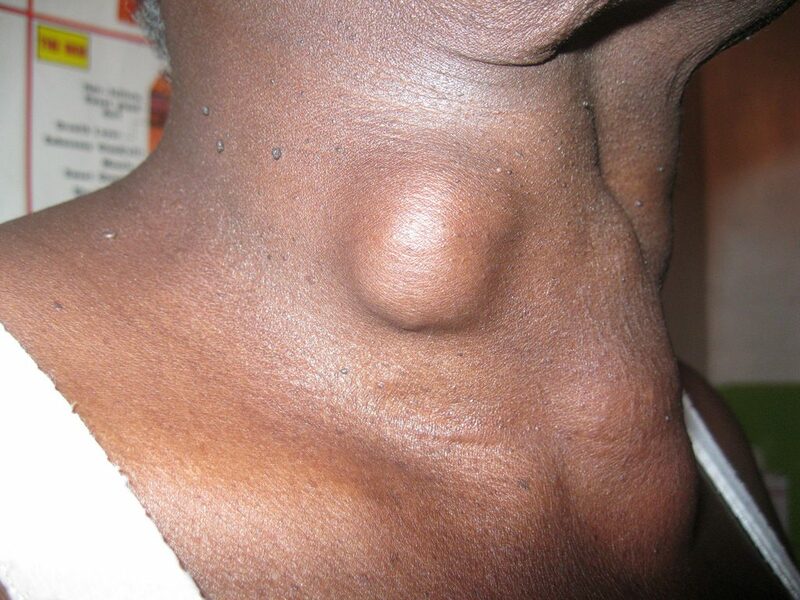 This is the commonest type of thyroid cancer (75%), most commonly seen between 40-50 years and in women. There can be multiple lesions within the gland and they are rarely encapsulated. Histologically, cells are a mixture of papillary and colloid-filled follicles, with papillary projections and pale empty nuclei. They commonly spread via the lymphatics. Usually seen at 40-60 years and in women, the second most common thyroid malignancy (15%). They present as focal encapsulated lesions (multifocal disease is rare), with microscopic capsular invasion*. Where metastasis occurs, it is usually via haematogenous spread to bones and lungs. These make up around 3% of thyroid cancers and arise in the parafollicular cells (C-cells, derived from the neural crest cells). Consequently, they produce raised calcitonin levels and are associated (20% of cases) with MEN 2 syndrome (both 2a and 2b). Medullary carcinoma can spread by both lymphatic and medullary routes; unfortunately nodal disease is associated with a very poor prognosis. These rare tumours, accounting for 5% of thyroid cancers, usually present in the elderly and are very aggressive. They tend to grow rapidly with early local invasion and often have spread by the time of presentation. Prognosis is poor and treatment is often supportive. Thyroid lymphomas are very rare, making up only 1-2% of all thyroid cancers. They usually present in people over 60 years old. They may grow quite rapidly, with marked compressive symptoms and B-Cell symptoms. Thyroid cancers may present as a palpable lump, multiple lumps, or be found incidentally on imaging of the neck. It is important to remember that most lumps or swellings of the thyroid are not malignant, however some of them may still require surgical intervention for diagnosis or management. 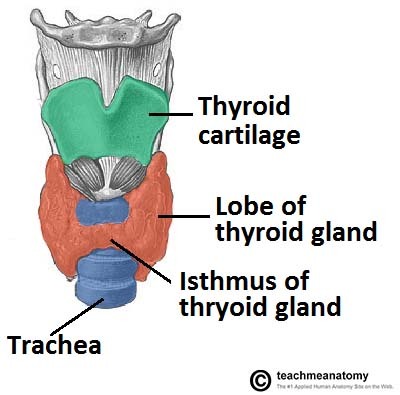 Most patients with a neck lumps should have initial Thyroid Function Tests* (TFTs) performed. 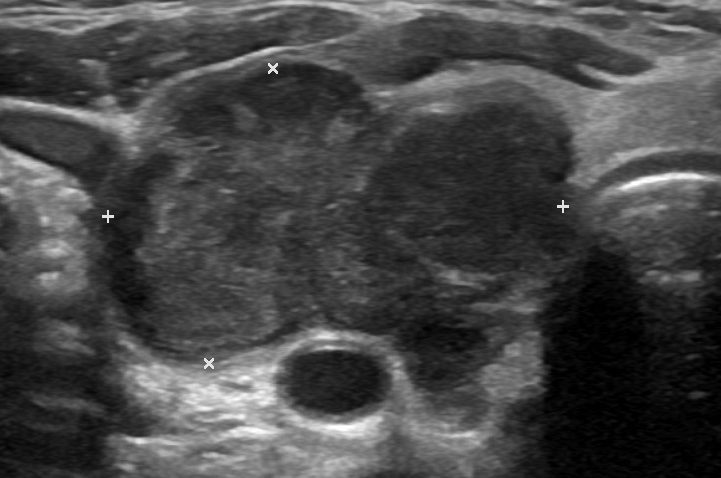 Any evidence of a toxic nodule (low TSH or raised T3 or T4, or radio-nucleotide imaging showing a “hot” nodule), then no further investigation for malignancy will be required as overactive nodules are very rarely malignant. *Serum calcitonin may be useful for the diagnosis and monitoring of treatment response in medullary carcinoma. A score will be allocated (U1-U5). U1-U2 lesions have low risk of malignancy and will not require fine needle aspiration cytology (FNAC), U3-U5 lesions should undergo FNAC. Thyroid cancer should be managed by a multi-disciplinary team, including endocrinologists, histopathologists, radiologists, oncologists, and ENT surgeons, alongside of specialist nurses and speech and language therapists. The management varies depending on the type of cancer as well as the stage. Management options include surgical, chemotherapy, radiotherapy, and radio-iodine therapy. Locally advanced disease may also require neck dissection, to remove groups of lymph nodes from the surrounding region, both to aid diagnosis and attempt to reduce disease spread. Bleeding immediately after the operation can result in a haematoma forming beneath the skin. Large haematomas can cause airway obstruction, which is an emergency. In this situation the surgical wound must be re-opened (on the ward!) to allow drainage of the haematoma and the patient will need to go back to theatre to stop the bleeding. The recurrent laryngeal nerves run close to the thyroid gland, hence care during surgery must to taken to prevent damage causing vocal cord paralysis. Unilateral palsy will result in a hoarse voice however a bilateral paralysis can result in a life-threatening stridor and tracheostomy may be warranted. Radioiodine therapy involves administration of a radioactive iodine solution, which is taken up preferentially by residual thyroid tissue, acting a focal radiation targeting the malignancy (used for papillary or follicular carcinomas). Only effective after total thyroidectomy. External beam radiotherapy can be used as primary or adjunct therapy (curative or palliative). Chemotherapy can also be used for similar means, classically lymphomas usually responding well to chemotherapy, and symptoms can improve within a few doses. The prognosis of thyroid cancer depends on the histological subtype, the grade, and the stage of the malignancy. Medullary cancer also has a good prognosis, with 10 year survival dropping only below 90% when nodal or metastatic spread is seen. 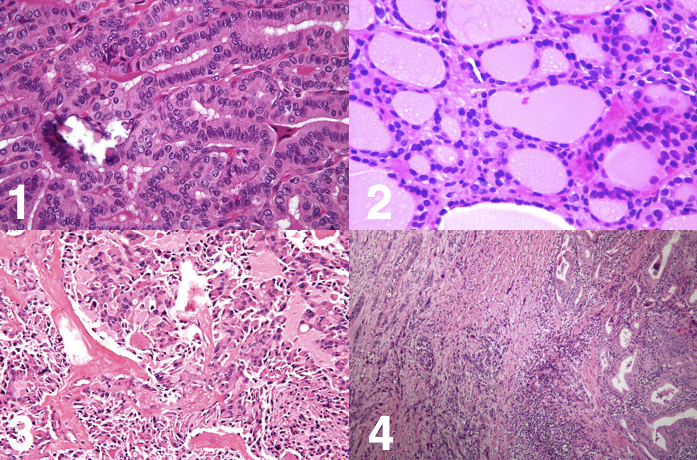 Which patient is most suspicious for thyroid cancer? Which of the following types of thyroid cancer has the worst prognosis? A patient is experiencing voice hoarseness several days post-operatively after thyroidectomy for follicular thyroid cancer. What is the most likely reason for this? What blood test is used to test for recurrence of medullary thyroid cancer after initial treatment? Which type of thyroid cancer has a hereditary component and is associated with MEN-2 syndrome?